Last January I shared my predictions with Tech & Learning about what I thought would be big in hardware and software in 2013. -->Lifting the ban on use of cell phones and other student-owned digital devices in school; providing home Internet access by working with Internet providers to offer special rates and packages to students who qualify for subsidies; going paperless as districts reallocate resources toward digital solutions; customizing learning with digital lectures and learning resources that are available anytime, anywhere. 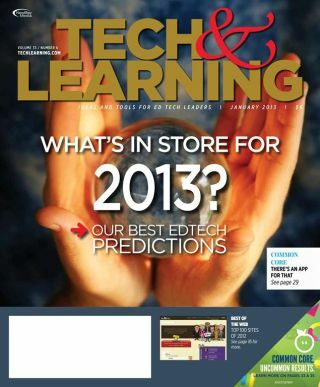 This year Tech & Learning is running a follow-up article in their January 2014 issue and asked, me to share what I thought about my predictions. Here is what I shared. In reviewing my 2013 predictions, I have been pleasantly surprised to see that I was on target this past year. As reported in Crains New York Business elected officials in the largest school district in the nation, have vowed to make the school cellphone ban history and will indeed be pushing internet providers to offer special rates and packages to students qualifying for subsidies. Additionally, stories are proliferating the media in general and education publications like Ed Week and Ed Horizons in particular about the importance of social media for student success. New York City has embraced this fully putting out guidelines for both staff and more recently students to support the effective use of social media for academic, career and citizenship success. Finally, just Google “School district going paperless” and you’ll see districts across the nation in celebration of savings, efficiency, and enhanced learning as they ditch pounds of paper in exchange for a digital diet. 1) Technology replacing traditional teacher roles. 2) Social media for social action. The work parents and students are doing to have more in a say in the education of their family will be heard louder than ever via social media. We will begin to see a shift away from corporate-driven agendas and toward agendas driven by citizens who will use social media as a pulpit to demand their voices be heard. As testing continues to proliferate our schools despite community dissent, more families who have the will, will find a way to explore alternatives to public education. This will include not only private school options, but also an increase in homeschooling as well as out-of-the-box thinking that includes replacing high school with community college, pursuing online learning options, community learning centers, and part-time school.